Off-duty Fort Dodge Firefighter Jeff Hill, left, works with Otho and Duncombe firefighters to put out a house fire that started in a closet Wednesday morning in Coalville. 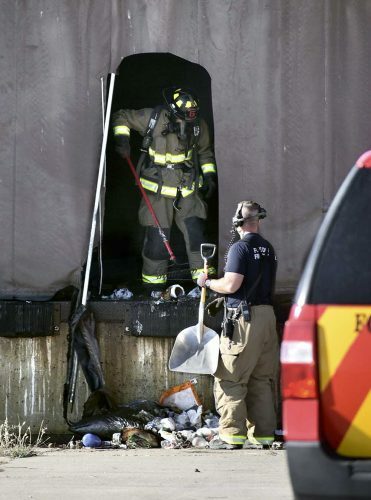 Hill and two other Fort Dodge Firefighters happened to be nearby and responded to help the two departments out. Family members wait with two dogs and cats they got out of the house, as firefighters take a hose line in to combat the fire spreading through the hallway. The fire was put out before causing major damage to the structure. 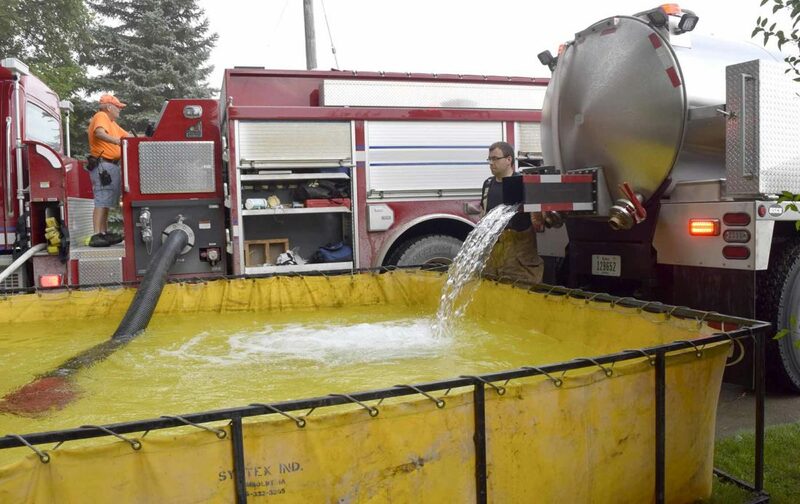 Don Zehner, Duncombe Firefighter, left, and Dylan Hagen, Otho Firefighter, fill a drop tank from an Otho tanker truck to feed the Duncombe pumper. 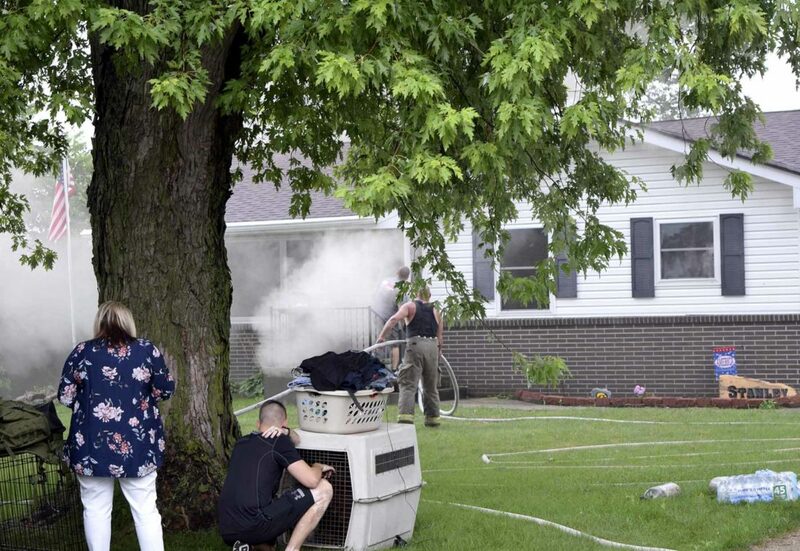 COALVILLE — A working smoke detector may have saved a home after fire broke out in a closet Wednesday morning, according to Otho Fire Chief Marty Smith. The homeowner had worked a night shift and was home sleeping when the alarm woke him up, Smith said. Thanks to his call, Otho and Duncombe fire departments were able to arrive on scene in Coalville quickly. 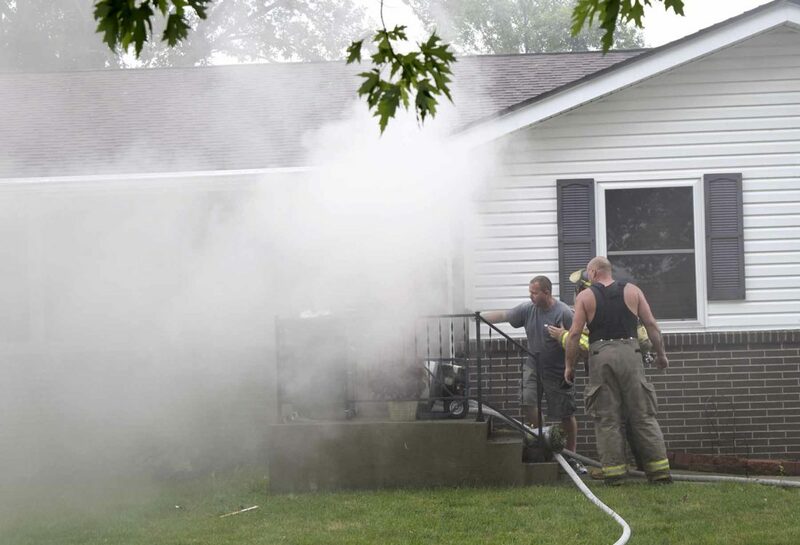 The fire was reported around 9:15 a.m. at 2414 235th St., Coalville. The cause is still under investigation, Smith said. There was smoke damage throughout the building, but fire was stopped from spreading to the bedrooms thanks to the quick response from both fire departments, Smith said. No one was hurt in the fire, and two dogs and a cat got out of the house safely. Trucks from Otho and Duncombe arrived about the same time and ran hose lines into the structure, Smith said. The fire is not considered suspicious, Webster County Sheriff’s Sgt. Jayson Heesch said. Three off-duty Fort Dodge firefighters happened to be nearby and came to help out the responding departments, Heesch added. The sheriff’s department and Iowa State Patrol also responded. Fire crews were finishing their work by 10 a.m.